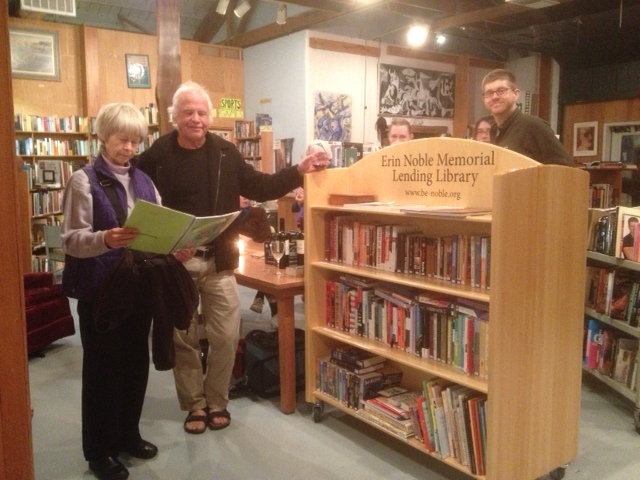 In December 2014 a Be-Noble Gathering to dedicate the Erin Noble Memorial Lending Library with a Grand Opening was held at Tsunami Book Store. Please feel free to visit and read some of Erins favorite authors! A longtime effort to preserve forested land in south Eugene near the Amazon Creek headwaters is complete. The city of Eugene and a private nonprofit foundation led by Deborah and Peter Noble this week concluded their $1.75 ¬million purchase of 26 acres near Martin Street and West ¬Amazon Drive. A claim over attorneys’ fees that delayed the acquisition slightly has been resolved. The Be Noble Foundation paid $625,000 for an 11-acre ¬parcel that it now owns. The Nobles live next to the hillside property, which for several years had been owned by Martin and Leslie Beverly. The newly acquired land will become part of the extensive network of mostly city-owned, forested open space near the Amazon headwaters. The city has placed a pair of easements on the Be Noble Foundation property to ensure public access to the land and to prevent buildings from being constructed on it, Noble said. People for years have walked on the parcels, creating their own trails, Noble said. “The public has used the property even before the Beverlys bought it,” she said. directional signs on the land, he said. The acquisition ended years of controversy over the property.At various times since the 1990s, the Beverlys had tried to gain city approval to develop the land with houses. Local residents ¬opposed the plans and sought to keep the land as is. For years, the Southeast Neighbors neighborhood association asked the City Council to acquire the land so it could be preserved in its natural state. Last year, the City Council said it would be willing to approve a reasonably priced purchase, but that local residents would have to help with the acquisition. Negotiations began with the Beverlys. At one point, the Beverlys were asking $2.5 million for the 26 acres. But the Beverlys lost the property last year in lieu of foreclosure to Dynasty Holdings, a business group headed by Springfield accountant James Youel. Eventually, the city and the foundation reached a deal with Dynasty that was announced in November. Dynasty by Eugene land use attorney Bill Kloos. Kloos sought $47,000 in legal fees for his work representing the Beverlys. Kloos this week said he had received the fees, which ended the lawsuit, clearing the way for the properties to change ownership. “That will be a nice addition to the park system,” Kloos said of the former Beverly property. The Nobles established the Be Noble Foundation in honor of their son, Erin, who was killed in a 2012 plane crash near Veneta. The public donated some of the money to buy the 11-acre parcel owned by the foundation, but Noble said she and her husband contributed the majority of the $625,000. the Amazon headwaters trail network and build a trailhead and creek-crossing bridges off Canyon Drive. In 2008, the council approved buying 40 nearby acres from developer Joe Green for $1.6 million so it wouldn’t be used for housing. About a third of the purchase price, $500,000, came from the parks bond measure. The Eugene City Council this week gave advocates for preserving the headwaters of Amazon Creek something to be thankful for over the holidays. The council agreed Nov. 24 to acquire two lots of property in the Martin Street area to add to the Ridgeline Trail system. The Be Noble Foundation will acquire a contiguous third lot. The three lots, totaling about 26 acres, contain two main branches of the Amazon Creek headwaters as well as lush habitat for both plant and animal wildlife. The city of Eugene will pay $1.125 million, funded by $1.1 million from the parks bond measure passed by the voters in 2006, and a $25,000 donation from the Lane County Audubon Society. Be Noble Foundation will pay $625,000 and maintain ownership of one lot with a conservation easement in memory of the Erin Noble who died in a private plane crash in 2012. The newly acquired natural area will supplement existing public park and natural areas in the vicinity of the Amazon headwaters, including Frank Kinney Park on the north side of Martin Street and more than 100 acres along a main tributary of Amazon Creek to the east and south of the newly acquired area. Amazon Creek, which drains about 60 percent of the city of Eugene, “flows through a diverse mix of land uses including forested headwaters, highly urbanized lands, parks, natural areas and farmland on its 22-mile westward journey to the Long Tom River,” reads a prepared statement from Craig Carnagey, director of the city’s Parks and Open Space Division, and Charlie Tebbutt, spokesperson for Be Noble Foundation. This land provides a valuable ecological corridor between the Amazon greenway and the headwaters of Amazon Creek, according to the Be Noble website. The website also notes that this site was identified by the Army Corps of Engineers in its Metro Waterways study as a priority open space acquisition area for the protection and restoration of Amazon Creek. “Erin Noble, a beloved member of the community, had committed to assist in the efforts to preserve this important ecological area before he tragically died,” Tebbutt says. “He was, among his many talents and interests, an avid hiker who frequently trekked through the headwaters area to the Ridgeline Trail and Spencer’s Butte summit. Erin’s parents set up Be Noble Foundation to carry on Erin’s commitments to preserve Eugene’s vsion of the Amazon headwaters.” Tebbutt says the foundation will ask that the area be named in Erin Noble’s memory. A 26-acre property in South Eugene will be preserved thanks to a private / public partnership between the City of Eugene and the Be Noble Foundation. The 26-acre property in South Eugene includes the headwaters of Amazon Creek. The property includes the headwaters of Amazon Creek and is habitat for wildlife and a favorite hiking place for locals. The city and Be Noble Foundation purchased three lots for a total of $1.75 million. Eugene attorney Charlie Tebbutt represents Be Noble Foundation. It was created in honor of Erin Noble, a young man who died in a plane crash near Veneta in 2012. Noble was committed to saving the property from development. Be Noble to Request That Park Space Be Named In Honor of Erin Noble. The Eugene City Council today agreed to acquire two lots of property in the Martin Street area to add to the Ridgeline Trail system. In addition, Be Noble Foundation will acquire a contiguous third lot. The three lots, totaling about 26 acres, feature two main branches of the Amazon Creek headwaters as well as habitat for wildlife. The newly acquired natural area will supplement existing public park and natural areas in the vicinity of the Amazon headwaters, including Frank Kinney Park on the north side of Martin Street and more than 100 acres along a main tributary of Amazon Creek to the east and south of the newly acquired area. Amazon Creek, which drains about 60 percent of the city of Eugene, flows through a diverse mix of land uses including forested headwaters, highly urbanized lands, parks, natural areas, and farmland on its 22-mile westward journey to the Long Tom River. According to the Be Noble web site, this is the only remaining place to make a connected ecological corridor between the Amazon greenway and the headwaters of Amazon Creek. The web site also states that this site was identified by the Army Corps of Engineers in its Metro Waterways study as a priority open space acquisition area for the protection and restoration of Amazon Creek. “Erin Noble, a beloved member of the community, had committed to assist in the efforts to preserve this important ecological area before he tragically died in a light plane crash on June 23, 2012,” said Charlie Tebbutt, local attorney and spokesperson for Be Noble Foundation. “He was, among his many talents and interests, an avid hiker who frequently trekked through the headwaters area to the Ridgeline Trail and Spencer’s Butte summit. Erin’s parents set up Be Noble Foundation to carry on Erin’s commitments to preserve Eugene’s version of the Amazon headwaters.” Tebbutt said Be Noble will submit a request to the City asking that the area be named in Erin’s honor. Big News! The City Council on Monday evening unanimously voted to partner with the Be Noble Foundation on a $1.775 million purchase of 26 acres near Martin Street and West Amazon Drive in south Eugene. Saving the 26-acre Amazon Creek Headwaters parcel has been portrayed as a battle between the North and the South over the last shreds of Eugene’s 2006 Parks Bond funds (RG 3/9/14). I couldn’t disagree more. Here’s the short story on why we should buy the Headwaters for everyone’s benefit and how we can easily pay for it right now. The timing is critical. The owners have received conditional approval for a Planned Unit Development (PUD) on 20.5 of the 26 acres. The property’s owners are willing sellers and they have reduced their offering price to a reasonable $2.5 million. Available funding sources include the remaining 2006 bond funds, the Parks System Development Charge (SDC) revenues, and City stormwater fee revenues. While much of the quarreling seems to be over the bond funds, the other funding sources have not even been mentioned. Why have neighbors been fighting for almost two decades to preserves this land? This area is one of the highest-quality unprotected natural resource sites in Eugene. Threatened and sensitive species are known to exist here including rare plants (aster vialis and cimicifuga elata), red-legged frogs, and pileated woodpeckers. This mix of forest, wetlands, and riparian areas is located at the headwaters of Amazon Creek, which drains much of the southern half of the city. In its natural state, this land provides numerous benefits, including recreational opportunities, wildlife habitat, water quality protection, and flood control. It is located conveniently at the end of West Amazon Drive just off a bus route and a bike route, and is easily accessible to every resident of the city. It connects directly to the Ridgeline Trail, a regional park system that benefits everyone. Parks SDCs are collected from new development to help expand the park system as we grow. For example, each new house will pay about $3,750 towards park facilities. That revenue has added up to about $2 to $3 million per year. These funds can only be spent on parkland acquisition and new park facilities (not maintenance or operations). Much of the revenue has gone unspent for the past few years and there is far more money available than needed to purchase the Headwaters. The funds from a separate Stormwater SDC could also be used for this purpose. The City’s Stormwater Fee is a monthly fee paid by all homes and businesses and generates $16 million a year to support stormwater management. The forested Headwaters provides natural flood control and stormwater management services that would be lost if it were developed. Using stormwater fees to acquire this land would help maintain water quality and could avoid millions of dollars in downstream stormwater mitigation costs. Natural systems, like forests, provide these services for free in perpetuity and don’t require regular maintenance or repair like man-made systems. Finally, rather than arguing over the remains of the 2006 Parks Bond, lets prepare a 2014 Parks Bond. Voters approved the first bond in 1998 with 66% of the vote, and the second one in 2006 with 58 percent. It seems the people of Eugene are willing, if not eager, to invest in our park system’s expansion. All the best cities in the country have made major investments in parkland. It contributes to quality of life, enhances property values, and gives a city dignity and respect that comes from preserving the beauty of open spaces and natural areas. Portland has the 5,000-acre Forest Park right next to the urban core. What would New York be without Central Park? And what would Washington, DC be without the Mall and Rock Creek Park? Amazon Creek. Photo by Todd Cooper. Walking through downtown, it’s easy to miss Eugene’s wayward waterway, hidden in culverts and secreted away behind swathes of pavement and sidewalk. Though Amazon Creek shares its name with a mighty South American river, the comparisons stop there. It once provided a connective pathway for fish and other wildlife traveling from its headwaters near Spencer Butte to the Long Tom River, which further connects to the Willamette River and drains all the way to the Pacific Ocean. But after heavy restructuring in the 1940s and ’50s to mitigate stormwater flooding, Amazon Creek took on an entirely different persona. Over the decades, the creek has succumbed to the pressures of its urban lifestyle. Stormwater drains directly into this tributary of the Willamette, carrying with it pesticides, heavy metals from parking lots and motor oil from leaky cars. Algae grows in the stagnant waters near South Eugene High School, forming a thick layer of slime during the summer, and the canals that redirect Amazon Creek’s flow seem more like stagnant moats than a corridor in a healthy ecosystem. Amazon Creek has its flaws, but like a delinquent child, it also has a number of people interested in its welfare. One of those people was Erin Noble, whose parents live close to the Amazon headwaters. Before his death in a 2012 airplane crash in Veneta, Erin used to hike from his parents’ house near the headwaters all the way to Spencer Butte several times a week. “He felt very attracted and drawn to this place,” says Deborah Noble, his mother, who has been actively involved in acquiring the Amazon headwaters for preservation. Erin’s friends say that he was a true adventurer, and not a moment of his 27 years was wasted. He traveled to England, France and Peru, hiked along the Pacific Crest Trail and always made friends along the way. His passion for people and the environment was a source of inspiration. Erin Noble’s love of Eugene and its natural areas came to the surface in June 2012, when he approached his dad about helping out with the Southeast Neighbors of Eugene in their goal to protect the headwaters. “Erin came to me and said, ‘Let’s save the Amazon headwaters, Dad,’” says Peter Noble, a longtime businessman in the timber industry and founder of West Wind Forest Products. 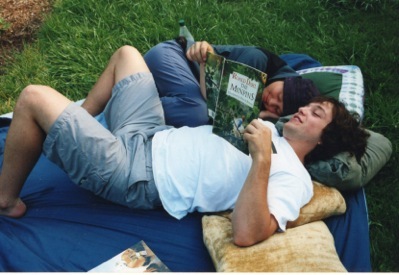 Erin intended to join the conservation efforts after he finished volunteering for the Oregon Country Fair, but the plane crash prevented him from carrying out his goal. In his honor, Erin’s parents launched the Be Noble Foundation, a nonprofit devoted to raising enough money to acquire the Amazon headwaters and protect them from development. Erin’s friends and family say they are committed to carrying on his spirit and legacy by saving the land he loved. They want to see a change in the way Eugene’s natural resources are treated. Deborah Noble in the forest where her son Erin used to hike. Kevin Matthews. Photo by Trask Bedortha. So far, the Amazon headwaters have avoided major restructuring from development, and the Nobles want to keep it that way. 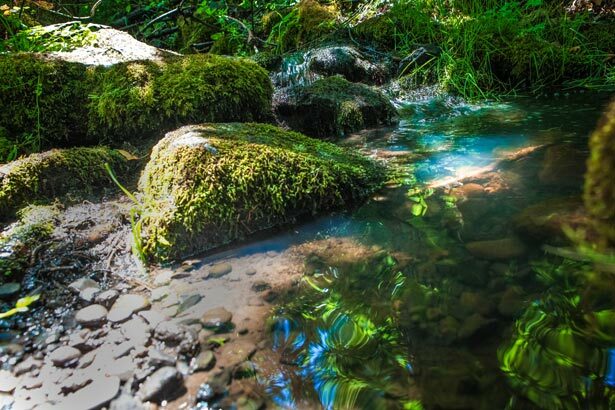 Nestled in the south hills of Eugene just above Martin Street, the headwaters carry water from the upper reaches of Amazon Creek to the lower portions, including those that run through town. The Ridgeline Trail follows segments of the creek, surrounded by towering oak trees and Douglas firs. Glimpses of Spencer Butte loom through the tree-shrouded sky, and the quietness that comes with a natural area prevails, save for the gentle tumbling of the stream. As water flows down from this area, it carries food, nutrients and debris to the ecosystems farther down, although right now, there’s not much of a functioning ecosystem directly below. But for Amazon Creek, change is happening. The Long Tom Watershed Council (LTWC) works with local businesses to improve water quality through simple measures such as landscape alteration. By building rain gardens and bioswales, areas of vegetation and soil that slow the entry of water into the stormwater system, businesses along the creek can reduce their impact on the creek’s water quality. Already, the LTWC has partnered with In Shape Athletic Club to remove excess asphalt from their property and replace it with soil and native plants, allowing stormwater to filter through instead of draining directly into the creek. It will take some time and effort, possibly including modifications to the concrete sections of the creek. But Jason Schmidt, the LTWC’s urban watershed restoration specialist, says that controlling water pollution is a big step in the right direction. If local businesses continue making adjustments to their landscapes, Amazon Creek could be well on its way to a state of remission. But the Nobles’ vision of a healthy Amazon isn’t yet a sure thing. While groups like the LTWC are helping the creek revert to a more natural state through town, the waterway’s point of origin might go in the opposite direction. The Amazon headwaters area is currently slated for development by Leslie and Martin Beverly, who own a 26-acre parcel of land that includes a portion of the headwaters. The Beverlys did not respond to a request for comment for this story. For more than 10 years, the Southeast Neighbors have worked together to block development of the headwaters, a partially successful effort on their part. In 2008, the city worked with the Southeast Neighbors to purchase 40 acres of land from Joe Green for $1.4 million. At this time, the Beverlys also offered to sell their land, but at a price of $4 million, and the city decided not to purchase. The land known as the Beverly property is the last parcel of the Amazon headwaters with its fate undecided. 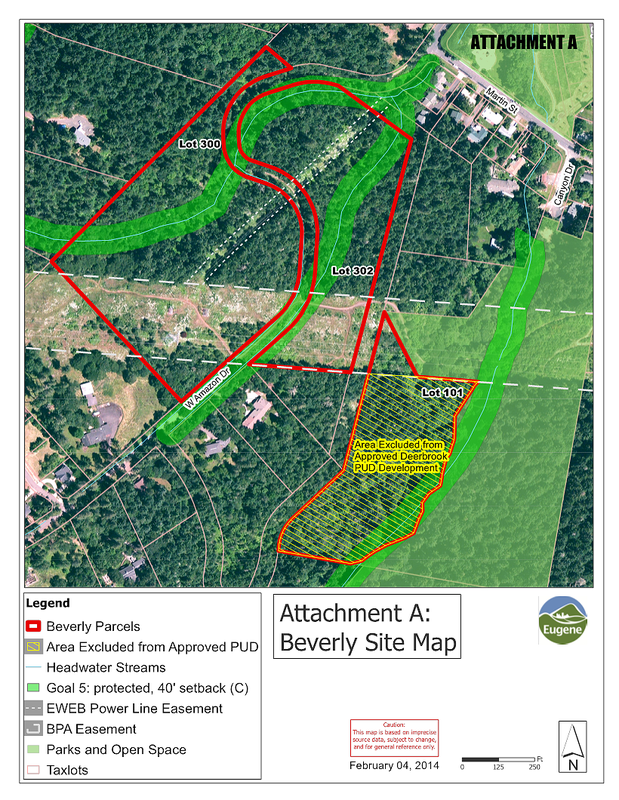 If the city of Eugene were to purchase the Beverly property, as it did with the Green property, it would most likely use funds from the 2006 Parks and Open Space bond measure, which is set aside specifically for acquiring or improving parks and natural areas and cannot be used for other purposes. The Southeast Neighbors estimate that a portion of land called the Deerbrook PUD property is worth approximately $1 million, and while the property has not been appraised since before the housing crash, Matthews says that the Southeast Neighbors have offered to partner with the Beverlys for re-appraisal, which has not yet happened. With Amazon Creek’s already dilapidated condition, paving the headwaters and building houses will impact the water quality further down. Proponents of conserving the Amazon headwaters argue that the headwaters represent a keystone area, crucial to retaining connectivity between watersheds and providing habitat to native plant and animal species. In the 2003 Rivers to Ridges Vision plan, which lays out a framework for future parks and open spaces in the Eugene metro area, the headwaters are identified as a possible park and open space area, and the report lists their importance in terms of scenic quality, connectivity and habitat. Jeff Krueger, a principal member of the team responsible for the Rivers to Ridges plan, says that the closeness of the headwaters to the Ridgeline Trail System makes them a desirable candidate for preservation. “In general, the headwaters area was one of those key areas in that open space vision,” he says. Building houses on the headwaters will be a big change for a landscape that has so far avoided urbanization. Over the years, the city has denied several attempts to build on the land due to the steepness of the parcel, but in March 2012, developers proposed to build 75 single-family houses on the Beverly property in the segment known as the Deerbrook PUD property. This would involve the clearing away of habitat and soil and the introduction of pavement. And troubled Amazon Creek, already smothered down by development where it runs through the city, takes a hit if the waters that feed the creek are modified to accommodate buildings. Everything flows downstream from the headwaters, meaning that soil disturbance and pollutants caused by construction can impact the entire creek farther down. The LTWC’s work in town to install rain gardens and bioswales reduces the negative impacts of too much pavement. While river lovers are hoping to remove concrete downtown, developers of the Beverly property plan to add more of it upstream. “As with any development that takes place, the impacts of impervious surface can lead to erosion in the creek channel and the carrying of other pollutants into the waters,” Schmidt says. According to Tom Pringle, a biochemist and researcher who has been actively involved in the restoration of a portion of Amazon Creek, an increase in impervious surfaces can lead to more flooding. Impervious services like concrete prevent stormwater from properly draining. Instead of soaking into the ground and seeping through a natural filtration system of soil, which removes contaminants along the way, water slides off of impervious surfaces and into storm drains, dumping the water into Amazon Creek unfiltered. Pringle says that runoff from Amazon Creek below 24th Avenue could create costly flooding without proper management. When the creek experiences a spike in peak flow after heavy rainfall, the headwaters play an important part in mitigating that flow. “In a sense, property owners wanting to develop the last of the upper watershed have to pass off the downside costs of development to people, nature and businesses below them in the watershed,” Pringle wrote in an email. Development also presents a problem to native plant and animal species, some of which are considered by the state of Oregon as rare or threatened. The Mayor’s 2008 Ad Hoc Committee report on the Amazon headwaters said that professional biologist Dave Konfranek discovered several species of rare mosses and lichen on the former Green property, while biologist Tom Titus found the state-listed sensitive northern red-legged frog in the headwaters area. The 2012 development project was initially rejected, but the Eugene Planning Commission voted in December to approve the PUD with a reduced number of houses. The Southeast Neighbors then appealed the reversal to the Land Use Board of Appeals (LUBA), and they’re currently raising money to cover the legal costs of their appeal. Matthews says that the Southeast Neighbors have already raised $27,000, but they are in need of $13,000 more to continue paying their legal defense bill. What happens next depends on LUBA’s decision. When Erin Noble walked through the forested areas of Amazon Creek, eyes set on the outline of Spencer Butte, he felt a connection to the natural landscape. Before he died, he expressed his love for the headwaters and his desire to keep them free of development. His friends and family carry on his dream now, but so do organizations like the LTWC, which seek collaborative solutions to improve water quality and restore some of Amazon Creek’s original functions. At this point, when the creek is drawing ever closer to its natural state, a step in the wrong direction could be a huge setback, further stalling the appearance of cutthroat trout and other wildlife. A community effort is underway to protect the headwaters of Amazon Creek and 26 acres of the natural sloping woodland area that serve to shelter and filter the springs and rivulets that issue from it. Three main branches of the Amazon Creek system are encompassed by the property. Understory plants cloak evidence of occasional landslides in this wetland environment. Mature trees, including black cottonwood, big-leaf maple, Oregon ash, willow, and a few ponderosa pine, contribute to the forest habitat of birds, aquatic creatures, small mammals and deer. This tranquil watershed also accommodates hikers, amblers and joggers on a low-key network of trails within easy walking or bicycling distance of Martin Street, Fox Hollow Road and Spencer Butte. BikeInShapes is bubbling in anticipation to honor and continue celebrating the life of Erin Noble. 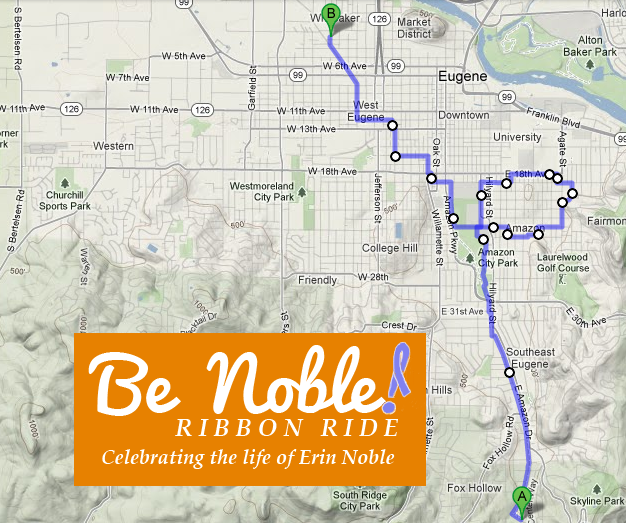 We’re calling it the “Be Noble” ribbon ride. We will begin where many Noble mornings began, the Martin’s Trailhead off W. Amazon (See map). We’ll trot our bikes down the Amazon Creek running trail, looping Erin’s ribbon through town over to the Whitaker. The ride will conclude with fundraiser pints at Ninkasi. The time has been change from August 30th to Monday, September 3rd to accommodate a generous gesture from Ninkasi Brewing. Their tasting room is donating a portion of the beer proceeds all day Labor Day to Erin Noble’s Fund to Save the Amazon Creek Headwaters. Date: Labor Day Monday, September 3rd. Finish: Ninkasi Tasting Room, 7-9pm. Proposed is a 47 lot housing development that would threaten the Amazon Creek Headwaters. On June 6, 2013 at 11:00 am, Oregon Land Use Board of Appeals (LUBA) heard the Southeast Neighbors appeal of the Eugene Planning Commissions 4-3 decision to overturn City of Eugene Hearing Official’s denial of the Deerbrook Planned Unit Development application. The Deerbrook Planned Unit Development’s proposed site is in the heart of the Amazon Creek Headwaters. Best wishes to the Southeast neighbors! 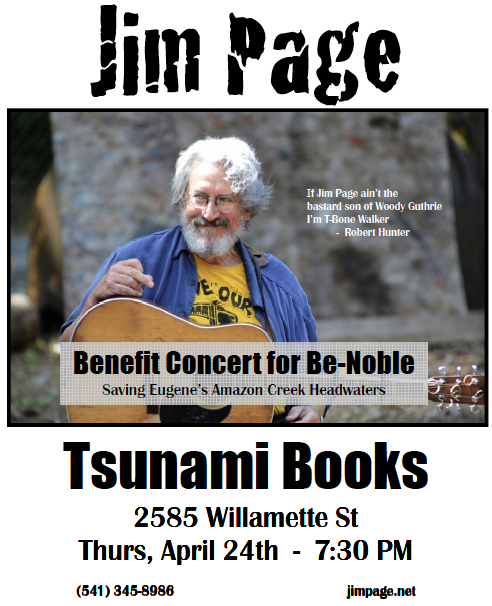 Featuring Folksinger Extraordinaire and long-time Country Faire favorite JIM PAGE (“I like the music to mean something and the singing to be for a purpose.”). Folks, if you've signed the petition, or in any way been a part of or interested in the action to save the 26 pristine acres of the Headwaters currently threatened by development, this is a must-hear event. We’re on the last leg of this long journey, and Jim’s music is the perfect way to get energized for the final push. Let’s pack the building as a way to honor both Jim and this most worthy cause. All donations gladly received! One hour guided hikes on the Amazon Creek Trail. The hike begins and loops back to the the Martin Street entrance. Click the map link below to view the area. Please Help Save The HeadwatersDonate Now! Be Noble promotes environmental stewardship and social causes in memory of Erin Noble.